You already know you'll need to cut back on your latte intake during pregnancy—but it turns out, there's a caffeine danger that probably never crossed your mind. You know that too much caffeine can be not so great for your pregnancy—but did you know that it's not just about the amount of coffee you drink while with child that can affect your baby's health? According to research from the National Institutes of Health and the Ohio State University Wexner Medical Center, a woman is more likely to miscarry if both she and her partner drink more than two caffeinated beverages a day in those weeks leading up to conception. That's right: What a woman's partner consumes has an effect on this too, as does caffeine that's consumed before conception. "Lots of studies have examined the role of lifestyle on pregnancy outcome, but most of these studies are unable to comment on periconceptional exposures because women are typically already pregnant when they are enrolled in these studies, so it's too late to collect the needed data," Courtney Lynch, Ph.D., one of the study's authors, told Fit Pregnancy. "There is a growing body of evidence to suggest that exposures even as early as around the time of conception can affect the health and development of the child." It makes sense that a woman's lifestyle could affect her baby's outcome, but how do her partner's habits play a role? "More basic science research is needed to better understand how paternal exposures affect health of the offspring," Lynch said. "However, right now, the effect is thought to be mediated through epigenetics. Epigenetics refers to changes in gene expression that are inherited and are not due to changes in the DNA sequence itself. For instance, poor quality paternal diets have been shown to be associated with changes in metabolism in their children." The study, which was published in Fertility and Sterility, was conducted with the purpose of examining the influence of lifestyle and environmental factors on reproductive outcomes. Authors found that while excess caffeine consumption could increase the risk of miscarriage, taking a daily multivitamin could reduce that danger, though it's unclear why. Here's what you should take from all this: What you do to your body before you get pregnant matters. "The first thing that couples can do is to recognize the growing body of evidence that suggests that their health and lifestyle around the time of conception can impact not only pregnancy outcomes, but also the health of their children. 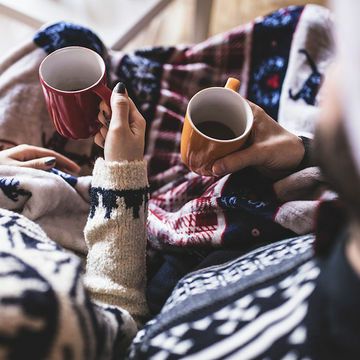 With that in mind, couples should do what they can to adopt a healthy lifestyle, including minimizing adverse exposures such as excessive caffeine consumption. Another key finding of this work is that daily use of multivitamins both preconception and in early pregnancy was associated with a reduced risk of pregnancy loss. This underscores other work that suggests that daily multivitamin use is important for all women of reproductive age, recognizing that half of all pregnancies in the U.S. are unplanned," Lynch said.